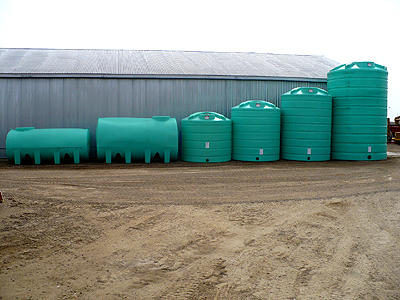 We have a number of AgriMaxx poly vertical and horizontal tanks in stock. Ideal for sprayer water, liquid feed or fertilizer. New Enduraplas THD03200K sump bottom transport tank, 3,200 gallon capacity, with steel frame and eight pins securing tank to frame. Tank is 145" long, 97" wide and 84" high, 16" stainless steel top lid, 3" bung in sump, 100% drain-out. Lists @ $7,299. Also includes sight gauge kit (sight gauge not shown in photos). We stock three types of Honda-powered transfer pumps. Pumping capacities range from 190 gallons per minute to 300 gallons per minute. New Enduraplas STNT1200-LD 1,200-gallon tank on DOT highway trailer, two 7,000 pound axles with four wheel electric brakes with optional four-foot wood deck for tote etc., DOT lights and reflective tape, trailer ball hitch (clevis hitch available), two safety tow chains, heavy duty fenders, tank has full length channel sump, set of four 235/80R16 LRE highway speed tires, Honda GX160 5.5 hp engine with recoil start, 2" poly pump, 2" standard complete plumbing with ball valves, poly pump cover, includes optional chemical inductor mounted and plumbed to trailer, optional recirculation kit, tongue jack. Grey trailer with fog green tank. This is a loaded tank/trailer combination. New Enduraplas STNT1200-LD 1,200-gallon tank on DOT highway trailer, two 7,000 pound axles with four wheel electric brakes with optional four-foot wood deck, DOT lights, DOT reflectors, trailer ball hitch (clevis hitch available), two safety tow chains, heavy duty fenders, tank has full length channel sump, set of four 235/80R16 LR E tires, Honda GX160 5.5 hp engine with recoil start and 2" poly pump, 2" standard complete plumbing with ball valves, poly pump cover. Red trailer and black tank with sight gauge at front of tank. Tongue jack. New Enduraplas STNT 1100, 1,100 gallon nurse tank trailer, clevis hitch, tank with full drain sump, set of four 235/80R16 highway tires on ag rims, two 7,000 lb. spring axles, two safety tow chains, 5,000 lb. sidewind jack, side step, B/S 6.5 hp. 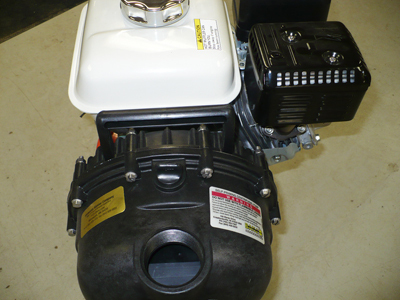 Intek Pro motor with recoil start, CB200 P6 2" pump, basic 2" plumbing with hose, Banjo valves and cam lock fittings. New Enduraplas SLC200FG8GR 200-gallon Land Champ 3 pt. mounted sprayer, three manual valves with adjustable pressure regulator and gauge, tank sight gauge, 18-gallon flush tank/safety tank with sight gauge, CAT I or CAT II 3 pt. hitch mast, sprayer frame has integrated pallet fork cutouts for easy removal from tractor, large 16" submarine style tank lid, Delavan 6900C six-roller PTO pump with flow rate of 8 GPM, hand gun with 15' of hose, tank size: 36" long X 48" wide X 52" high, 30-foot manual X-fold galvanized boom with 18 nozzle bodies on 20" spacing. Includes diaphragm bodies with 110-degree #2 (yellow) spray tips. Weight of sprayer with 30-foot boom 400 lbs. New 2017 Enduraplas SLC100FG8GR 100-gallon Land Champ 3 pt. mounted sprayer, three manual valves with adjustable pressure regulator and gauge, tank sight gauge, 10-gallon flush tank/safety tank with sight gauge, CAT I or CAT II 3 pt. hitch mast, sprayer frame has integrated pallet fork cutouts for easy removal from tractor, large 16" submarine style tank lid, Delavan 6900C six-roller PTO pump with flow rate of 8 GPM, hand gun with 15' of hose, tank size: 27" long X 44" wide X 48" high, 20-foot manual X-fold galvanized boom with 12 nozzle bodies on 20" spacing. Includes diaphragm bodies with 110-degree #2 (yellow) spray tips. Weight of sprayer with 20-foot boom 315 lbs.